The media loves to compare the current War in Afghanistan with the 1979 Soviet Invasion. It’s practically a miracle their memories go back that far. Canadian military intelligence officer Pete Mitchell takes a wider view, drawing lessons from Alexander the Great (who ultimately triumphed in Afghanistan, but in a pyrrhic sort of way). However, the sudden reappearance of a heroic anti-Soviet mujahidin commander represents a significant opportunity to win over hearts and minds. Of course, like everything else in Afghanistan, recruiting the so-called “Ghost” will be a tricky business in Paul Gross’s Hyena Road (trailer here), which opens this Friday in Los Angeles. Also known as Route Fosters (you could really use a cold one after driving down it), Hyena Road was cut through some of the most dangerous real estate in Kandahar. Building it is an arduous process that cost the lives of many civilian contractors. Gen. Rilmen is determined to keep construction going, but with supposed allies like the not-so-secretly-Taliban associated warlord “BDK,” the going is tough. It is Mitchell’s job to find a counterbalance. The Ghost would be perfect, especially a since he holds a family grudge against BDK. Mitchell first learns of the Ghost’s return when Ryan Sanders’ sniper team crashes an ambush intended for an approaching convoy. Surrounded by jihadists, Sanders and company prepare for the worst, but they are saved by the mysterious intervention of a village elder with different colored eyes. That detail catches Mitchell’s attention. With the help of Sanders and an intel source known simply as “the Cleaner,” Mitchell proceeds to woe the Ghost, but the war keeps getting in the way. If you assumed we already had more than enough grunt’s eye-view films of the Iraq and Afghanistan Wars, Hyena Road is proof you thought wrong. Gross has long been a big-name star north of the border, but he never found equivalent fame here, despite appearing in Due South and Tales of the City. 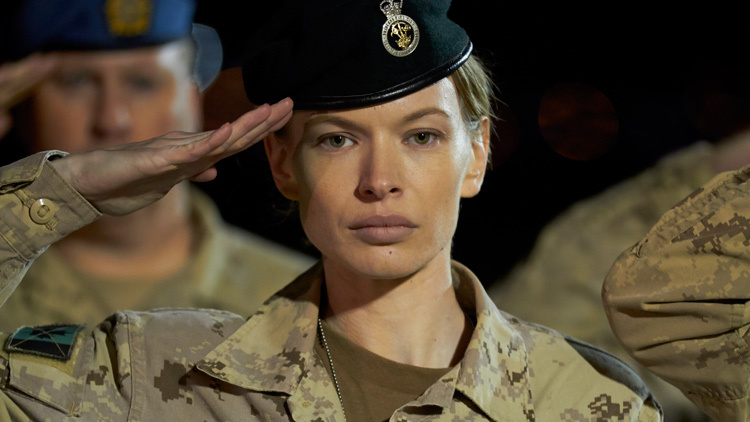 Frankly, Gross deserves breakout attention as both director and co-star of Hyena Road, but most critics will have trouble relating to his realistic depiction of the Canadian military. Gross is absolutely terrific as Mitchell, an avowed cynic, “but never when it comes to the Afghan people,” as he pointedly argues. He is tough, smart, charismatic, and at times a little ruthless. Gross’s portrayal will challenge viewers’ presuppositions, but ultimately we will hope there are people like him operating on the ground. Rossif Sutherland also inspires tremendous confidence as the salt-of-the-earth Sanders. He also develops some convincing romantic chemistry with Christine Horne’s Jennifer Bowman, an operations officer struggling with their potentially career-stalling romance. However, it is impossible to match the gravitas and street cred of Niamatullah Arghandabi, a government advisor and former comrade of the real freedom fighter that inspired his character. His presence really distinguishes Hyena, giving it significance above and beyond a ripping good war film. Gross stages several scenes of blisteringly intense combat that are also unusually crisply and cleanly filmed and therefore easy to follow. The warfighting feels real and so does the camaraderie. Frankly, the entire ensemble sound and carry themselves like military combat personnel, which is considerably harder to pull off than it sounds. 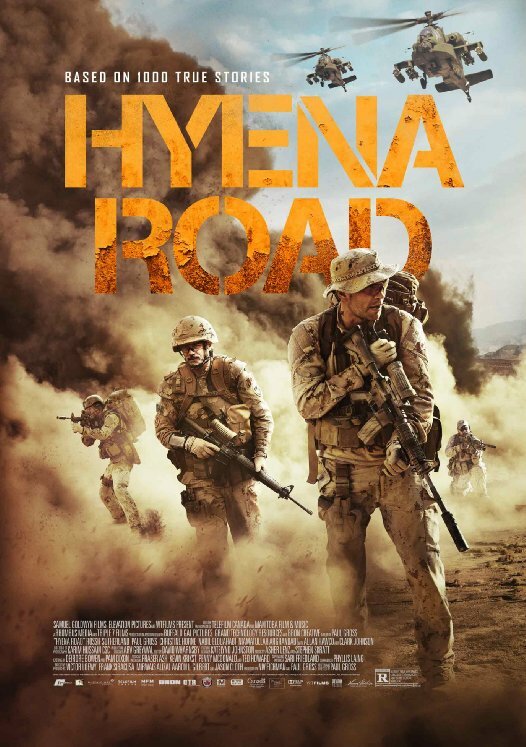 Very highly recommended, Hyena Road opens this Friday (3/11) in Los Angeles at the Laemmle Monica Film Center.